Unspayed female cats average 2-3 litters per year, but more are possible. 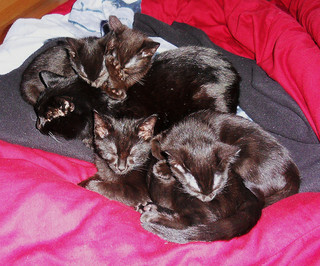 The average feline litter is 4 or 5 kittens, though a couple more or less is common. The record for most kittens in a litter is held by a Burmese cat in the UK, which gave birth to 19 (15 live and 4 stillborn). Although fertility declines somewhat and the litters of older queens tend to be smaller, cats of both genders remain fertile throughout their lifetimes. The oldest cat to give birth to live kittens was 30 years of age, and the record for most kittens produced over a lifetime by a single female is 420. Animal Rescue League. (2003). “Spay/Neuter.” Arlep.org. Hartwell, S. (2007). “Longevity.” MessyBeast.com. Seidensticker, J., & Lumpkin, S. (2006). Cats: Smithsonian Q&A: The Ultimate Question and Answer Book. Washington, DC: Smithsonian Books.